so we often think of them as rare or unimportant. simple compounds that plants can absorb. When we think of fungi, we usually think of mushrooms, either the kind in the grocery store or the type that grow on the forest floor after a rain. Compared to redwoods, they are rather small, and compared to crops like corn or wheat, they seem insignificant and unimportant, rather a minor player, a small, insignificant plant we can ignore. Fungi are both important and unique. They are important enough that life on Earth could not exist without them, and they are so unique that they are placed in their own Kingdom, on a classification level equal with the classification level "Plant" or "Animal". Far from being "small, insignificant plants", they are essential to our own survival and that of every plant and animal on the planet. And they are not "plants"! It may surprise you, but if they were not placed in their own Kingdom and were forced to be classified as either a plant or an animal, they would be placed with the animals, based on biological markers of evolution. Fungi share more molecular similarity with animals than with plants, implying that plants evolved from one ancestor and fungi and animals from another. Fungi are characterized by the fact that they are generally multicellular organisms, with a nucleus and a cell wall made of chitin (the same material that makes up the external skeletons of insects) and a unique mechanism of acquiring nourishment. In distinction from plants, which make their own food ("autotrophs", via chlorophyll), and animals which eat food ("heterotrophs", via eating plants or other animals), fungi neither eat nor make food: they absorb food. If you were a fungus and you wanted to "eat" a chocolate cake, you would stick your fingers into the cake, drip digestive chemicals off your fingers, and absorb the cake directly through your skin into your body! That is how fungi eat: they send parts of their body (hyphae) directly into their food, secret chemicals which helps to break the food down into simpler molecules, and then asbsorb the food directly into their cells. Fungi are not rare: they are everywhere. Just leave a piece of bread or fruit out on a plate and see how long it takes for a colony of fungi to grow. Compare this to plants: if you left out a tray of soil, how long might it take for a plant to sprout? Years? Fungi are everywhere, with billions of spores settling out of the air all the time. They are also present on the roots of virtually all vascular plants (ferns, conifers, and flowering plants), which depend on the fungi for many things. The fungi on plant roots form an association called mycorrhizae, a complex mutually benefical association. The mycorrhyzae increase the surface area of the roots. How much? One centimeter of root has about 3 meters of hyphae, an increase in length of 300x. This increases the surface area for the absorption of water. Ten cubic centimeters of soil may have 1 kilometer of fungal hyphae, having a fungal surface area of 300 square centimeters interfacing with the soil. In addition, the fungus actively and selectively absorbs minerals (especially phosphate ions) that the plant needs and transfers them to the plant, while excluding minerals that the plant does not need (sodium ions). The fungus also secretes growth factors that stimulate root growth and branching, as well as antibiotics that protect the root from pathologic bacteria and pathologic fungi. Remember, the antibiotic penicillin comes from the common bread mold, Penicilium. The root is just one organism growing in an underground world of competing and hostile bacteria, fungi (there are 30,000 species of fungus that are pathological to plants! ), and animals (nematodes), so the root needs all the help it can get. Fungi are very important to the health, growth, and function of roots. Fungi are also important in the recycling of organic material and nutrients. 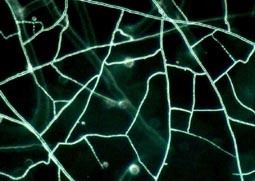 Without fungi breaking down dead plant and animal matter, carbon and other molecules essential to life would be locked in organic molecules that are too large for plants to absorb. Fungi break down organic molecutes, which are large, complex structures too large to pass across the cell walls of roots, into their inorganic constituents, such as carbon, nitrogen, and other constituents, which are much smaller (atoms). 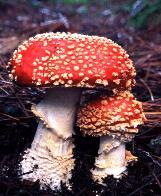 The air is so loaded with fungal spores, that the minute a plant or an animal dies, it is covered with spores. The fungal hyphae secrete exoenzymes and rapidly enter the body of the dead animal or plant. While we may applaud the fungi as they rid the world of dead organic material and make those nutrients available for re-use, it is a different story as they destroy our food and coat our shower curtains. It is estimates that each year fungi destroy 10% to 50% of our fruit crops, and a wood-digesting fungi does not differentiate between a fallen limb and a plank on a boat. During the Revolutionary War, the British lost more ships to fungal attack than to enemy attack. Soldiers who were stationed in the tropics during World War II saw their tents, clothes, boots, and some equipment be destroyed by molds. The vegetative (nutritionally active, as opposed to the reproductive) body of most fungi is usually hidden, being diffusely organized around and within the tissues of the food sources. Except for yeasts, which are unicellular, most fungi are multicellular, composed of tiny filaments called hyphae. The hyphae are composed of cell walls made of chitin (the same material that makes up the external skeleton of an insect), a cell membrane, and cytoplasm. 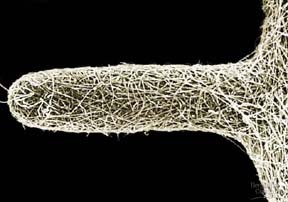 The hyphae form a interwoven mat called a mycelium, which is the "feeding" network of a fungus. The reproductive mechanisms of fungi are quite varied. Some reproduce sexually, with some cells being haploid (n, that is, only one set of chromosomes, like a human egg or sperm), some diploid (2n, that is, having a complete set of two of each chromosome, like most cells in a human body), and some being heterokaryous (n+n, that it, two sets of diploid chromosomes, but not united into a complete set of two copies of each chromosomes). Others reproduce asexually, such as the single-celled yeast, that merely grow a miniature yeast on their side, called a bud. This process is called budding. The life cycle of a fungus begins with a spore, the reproductive body. It is like a seed, in that it grows up into the adult organism, and, like a seed, it is highly resistant to drying out, which would kill the spore. Unlike a seed, which is a multicelled zygote plus nourishment, the spore is a single cell. When the spore starts to grow, a hypha begins to grow out of the spore. All hyphae are only one cell wide but many cells long. 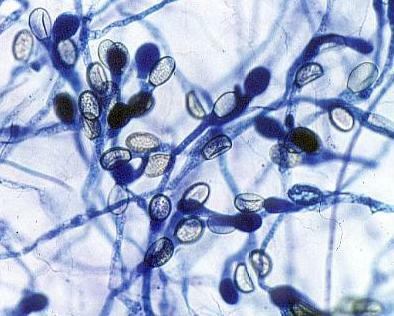 The body of a fungus is built up out of many threads of hyphae, collectively called the mycelium. The mycelium grows within the substance of its food: soil, plants, animals, people, dead wood or vegetation. When growing conditions are favorable, the fungus sends up fruiting bodies, which we recognize as mushrooms or other structures. These fruiting bodies produce more spores. As noted above, fungi are so prolific in producing spores that millions are raining down all the time. You can't put out a piece of bread without it being instantly colonized with fungal spores. 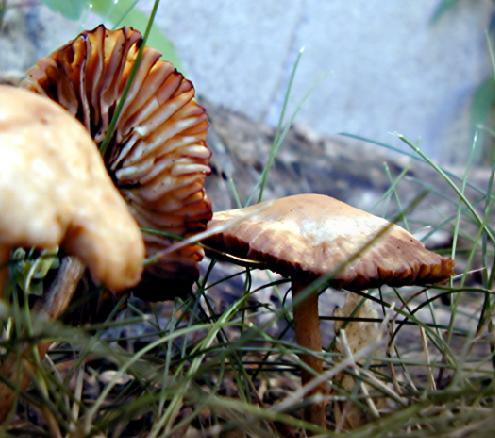 If you keep it moist, it will have recognizable fungi growing on it in just 3 to 5 days. This form of reproduction is called asexual reproduction. Many (but not all) fungi also reproduce sexually, but each of the four divisions of fungi have their own unique way of doing it. There are four phyla in the Kingdom Fungi: chytrids (Chytridiomycota), zygote fungi (Zygomycota), sac fungi (Ascomycetes), and club fungi (Basidiomycetes). Mushrooms are the reproductive structures of Basiomycetes ("basidium" means "little pedestal"), and the yeast that make our breads rise and our beer and wine alcoholic are either Ascomycetes or Basidiomycetes. Let's look at the four types in more detail. These fungi are mostly aquatic, are notable for having a flagella on the cells (a flagella is a tail, somewhat like a tail on a sperm or a pollywog), and are thought to be the most primitive type of fungi. Common black bread mold is a zygote fungi, and all of the mycorrhizae are zygote fungi, or zygomycetes (the suffix -mycete means "fungus".) They all are composed only of hyphae, which gives rise to another common name for this phylum: the Threadlike Fungi. They are important decomposers of dead organic matter, so this is a very important group. They can reproduce either sexually or asexually. Their cells may not have cell walls between the cells (septa), so the nuclei can move along the hyphae and it is hard to tell where one cell ends and another begins. They are mostly terrestial and live in soil or on decaying plant and animal material. 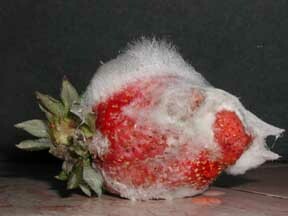 Lets look at the mold on the strawberry a little closer, so we can learn more about this common type of fungus. This is a basket of strawberries that is a few days old. It was not refrigerated. Notice the wispy mold growing. This mold is called Rhizopus. Here is the mold growing on one strawberry. 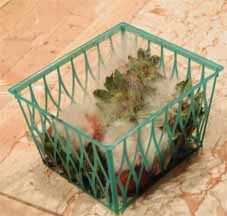 The strawberry is soft and soggy, due to the hyphae of the mold growing inside, secreting digestive chemicals. 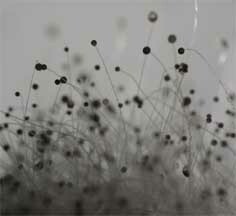 These are the sporangia, or spore producing structures, part of the asexual reproduction. Mildews and yeasts are part of the sac fungi, as well as the morels, mushrooms that are very highly prized for their flavor. They can cost hundreds of dollars an ounce, so this group is rather important, too. It is the largest group of fungi, with over 60,000 described species (according to Campbell's), and are found in a variety of habitats, including marine, freshwater, and terrestrial. They range in size from the single-celled yeasts to the tasty morels. This group, with about 25,000 species, contains the mushrooms and the shelf fungi. The majority of the fungus is underground, but when it needs to reproduce, the fruiting body, called a basidiocarp by scientists by called a mushroom by everyone else, is formed. The name comes from the Latin "basidium", which means "little pedestal", obviously referring to the mushroom shape. For more information on mushroom, click here. 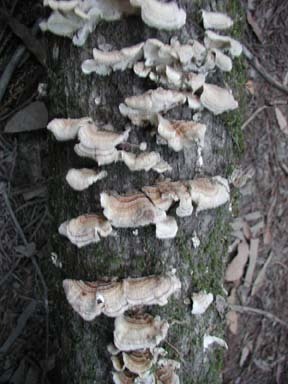 This shelf fungi was photographed a bit downstream of Caz, along the road to CazSonoma Inn, June, 2004. They are important decomposers of wood, which contains a complex polymer called lignin, which few organisms can digest. Without basidiomycetes, we would be buried under piles of dead wood, and our forests would not be able to grow, as all the nutrients would be locked up in the dead wood. I'm growing fungus on my feet. To tell the truth, it's kinda neat. I grew it for my science class. It's got so big, I'm bound to pass. But it's not easy growing mold. You must keep it dark and from the cold. And because of this, it's truly flowered. It's amazing just how fast it grows. You've never seen such fuzzy toes! It has the most delightful hue. It's sorta green and sorta blue. But there are drawbacks to its fungal riches. You won't believe how much it itches. And the smell is gross, I have to say. But it's worth it all to get an "A''. The Natural Kingdom has a section on Fungus. University of Hawaii Introduction to the Fungi. Sidwell Friends School in Washington, DC, has an interesting site. Tom Volk, a professor of biology, has a great site. The section on fungi is based almost entirely on the excellent book Biology, by Campbell and Reece. It is a college text for beginning biology students. I cannot recommend it highly enough. If it has been a few years (!) since you have had biology, you will not believe how much things have changed. Not only is there a lot more known about biology, the presentation of the material is vastly improved. From text that is closer to literature than dry explanation, to color illustrations and color photographs that are so widely used, I doubt that in its entire 1240 pages, there are any without at least three or more color graphics of some sort. And that does not even begin to explore the enclosed CD or associated online material. I will eat my hat if you don't love the book. I bought mine online, at Amazon.com. This section is also based on my daughter Maggie's seventh-grade biology book, Focus on Life Science, part of the Prentice-Hall Science Explorer Series. It may be hard to believe, but almost all of the material on this page is seventh grade science! A lot has changed since I was in seventh grade. The photograph of mycorrhyzae was found at website for St Anselm College, but appears to be from Campbell's Biology, referenced above. 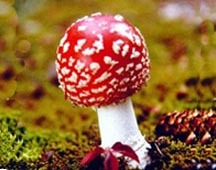 The photograph of the structure of a mushroom was from the website for a software company, efflare. The chytrid photo is from Cal Poly. 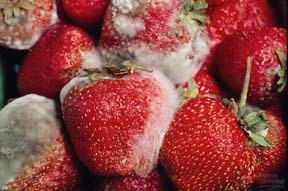 The top photo of mold on the strawberries is taken from the University of Alaska webpage on fungi, but seems to be orginally from Campbell's Biology. The other photographs of mold on strawberries, including the closeup, were taken by D. Nelson. 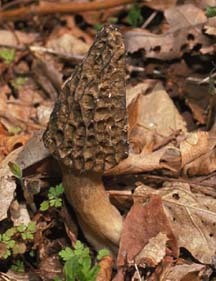 The morel is from Penn State's webpage on fungi. 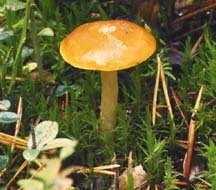 The club fungi is from the Finnish University and Research Network website. 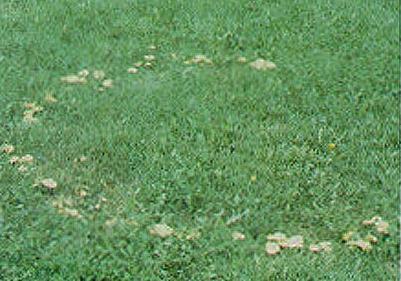 The fairy ring was from the Alabama Cooperative Extension's website on agricultural pests. *This webpage was originally created while at 30,000 feet, flying from Paris to San Francisco, June 18, 2004.